This afternoon I worked on a mixed media piece which has been hanging around for awhile waiting for me to finish it. The inspiration for this work came to me while listening to a CD by Sophia. I was listening to her sing ‘Gaia Shekhinah Nama Om’ at the time. 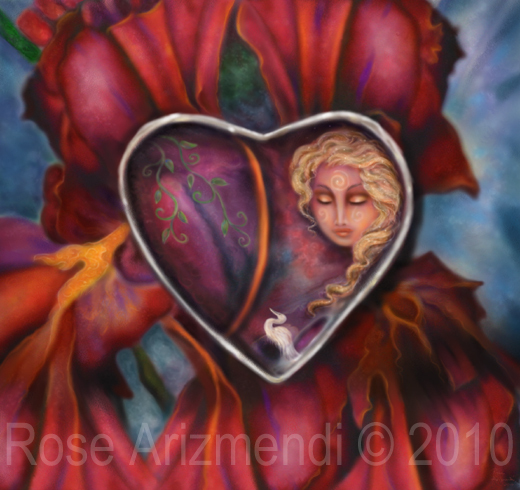 I kept playing the CD over and over again and as the music flowed over and through me, I created this painting. 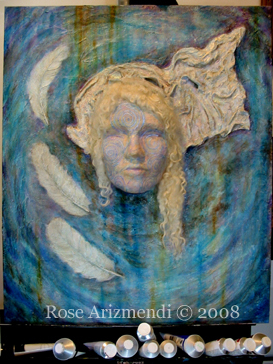 I sculpted the mask and the feathers out of paper mache, plaster and heavy acrylic medium. In Judaism, Chokhmah appears alongside the Shekhinah, ‘the glory of God’, a figure who plays a key role in the cosmology of the Kabbalists as an expression of the feminine aspect of God.